In 2004 I moved to Merton. Near my house the River Wandle flowed on its lazy journey from its two sources before linking up with the River Thames. Unlike many of London’s rivers, it was never buried in sewers and continues to flow in the open to this day. Twenty years ago it was dead. Nothing could live in the pollution. 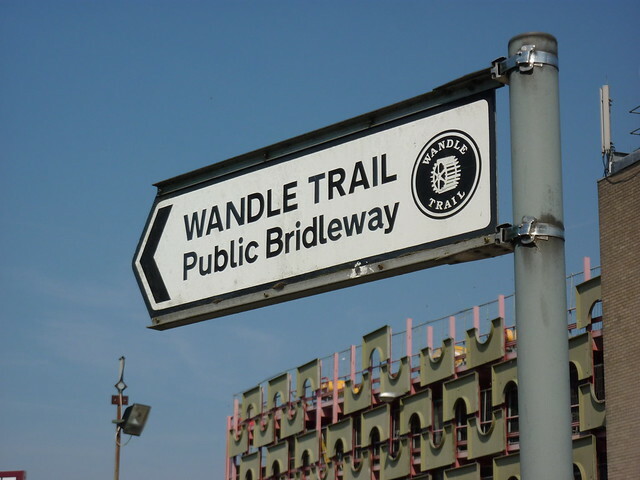 Cleaned up, it’s now alive and healthy and in its renaissance there’s a trail that follows its 9 mile journey – the Wandle Trail. And after seven years of living near it, I decided it was time to actually follow the thing. East Croydon railway station is a strange place for the 13 mile Wandle Trail to begin. It doesn’t really make much sense. The source of the River Wandle is actually a few miles up the road at Waddon Ponds, right next door to a tram stop. I could just sit on the tram and do the first part without even moving my legs. But the route guide I’ve downloaded off the internet says start at East Croydon and the guide must be obeyed so I head down Croydon’s shopping streets. Waitrose, Chick’n’box, Wimpy, Alders. The huge Park Lane with its underpass is full of cars and buses. The streets are full of early shoppers, office workers and a surprisingly large number of old women on mobility scooters. There’s no signs to direct you where you go in Croydon. Croydon Council plays no part in the Wandle Trail so you have to make your own way to the council boundary where Sutton pick up the ball. In the meantime I make my way as best I can using the map I’ve downloaded, picking my way to Wandle Park. A flat piece of greenery with a gasometer in the background, the Trail doesn’t linger and before the walker knows it, they’re crossing the tram tracks and down an urban side street. Smart looking houses line the road, and the Trail crosses Purley Way. Turn right for London, left for Brighton and Eastbourne. Or maybe just pop in to the giant John Lewis At Home store, or watch the horse and cart heading off towards the south coast. What you won’t see is any water. Well unless it’s raining. You won’t get that until Waddon Ponds where the Wandle finally sets off on its journey. There’s a second source at Carshalton but that’s a bit of a way off yet. Tomorrow Wandle Week continues as we enter the Borough of Sutton’s section of the Wandle Trail. See all my Wandle Trail photos in my Wandle flickr set.